Even when the cold, dark nights are approaching, nobody can blame you for wanting to make the most of spending your evenings outside. Whether you are using the seating area for the last time before covering it up and putting it away, entertaining some friends for a party or enjoying some peace and quiet, an outdoor fire pit can help to keep you warm as well as providing somewhere for you to toast some marshmallows and s’mores or even grill some food. They also make a great focal point. 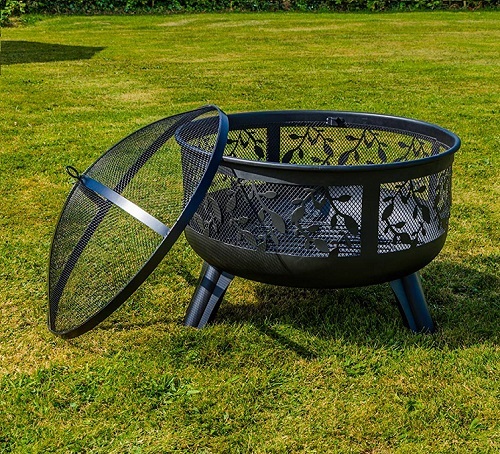 Providing top marks for price, looks, safety and ease of use, this VonHaus fire pit is a great option for any garden and is a great size. The open mesh geometric design means light and heat is given out in a complete 360° area, which makes it great for entertaining and using as a focal point. It can burn wood logs and charcoal, depending on preference, whatever you find more comfortable to use and the amount of smoke you’re willing to create. In terms of safety, there is a mesh lid cover to act as a spark guard, so spitting from the flames is reduced. You also get a heat-resistant poker, so you have a bit more control. As it only weighs 9.5kg, it is relatively easy to lift and move around. There are handles either side of the pit so you can lift it when you want to chase the sun or just store it away for the night. There is minimal assembly needed – all we had to do was screw the legs on and use some bolts to keep the lid in place. Instructions are easy to follow. The only downside is that you can’t use it as a grill, but if you want a fire pit purely for heat then this is not an issue and certainly doesn’t let it down in any way. It looks great, gives off a good amount of heat, feels sturdy and sits at a pretty good price too. What is not to love. Want a fire pit which looks elegant and eye-catching as well as giving out great levels of heat? Love the sound of a globe fire pit? There is no denying this item will create a focal point in any garden. With cutouts in the shape of deer and woodland, the flames are turned into a real spectacle and add to the outdoor ambience. The garden will be illuminated with flickering shapes. Unlike the majority of other fire pits on the market, continued use and the effect of the outdoor elements will actually only add to the overall look. It is already a copper colour, but a bit of extra tingeing from the flames will make it look even more rustic. If you want a pit that isn’t quite as flamboyant one night, you can use the base without the woodland globe on top for a back-to-basics fire bowl. It also makes it easy to remove the ashes which gather; just remove the top and tip them out. The gaps are great if you want to toast some marshmallows, and give off a great amount of warmth without being overbearing. Yes, the price seems a bit excessive, especially as seeing it is mostly all about looks rather than practicality. But the quality and design are pretty great and unique, so the investment is well worth it, especially if it will be used frequently. There is no better focal point for your Summer evenings in the garden than this globe fire pit, and the price will be well worth it over the years. Hate smoke and all the other by-products of traditional burning and barbecues? For a smokeless flame, gas is the way forward. It is a fuel which is popular with outdoor grills and is growing in popularity for fire bowls too. There is less maintenance needed too. With this particular Costway model, a square heating system offers a uniform flame and heat with a stable fire, and the intensity is changed with a simple selection of the low or high setting – no having to move around wood and charcoal or prod it. Not only is it great for the atmosphere, but also for the environment – the flame is clean, and there is no smell produced. As it is smokeless, you won’t have to move around the seating arrangements in line with the wind. It requires a 20lb propane tank, which could be a bit more costly than buying firewood over time, but the price of the pit is decent, so it won’t set you back too much overall. It does take quite a lot of gas though, so bear this in mind before you settle down for the night. Weighing only 9kg, we see no reason why you couldn’t take this camping or on a trip with you. It could work out a lot easier than taking firewood and all the extra utensils and is easier to turn off for safety. Just make sure the site will allow it. Gas fire pits can come in handy for ease of use, to get past flame restrictions and to cut the need for coal and other lighters - this one is worthwhile if you need something to take away with you. One of the UK’s best-selling fire pits, the Ball of Fire is perfect for creating a high level of heat and light. You have a full 360° view of the fire from all angles, as the mesh design is completely open rather than cut out or solid in places. This design acts as a spark screen, so there is little chance of anything flying out of the pit. The door is a flip design, so it is easy to open, and you don’t have to worry about setting the lid down on a safe surface protected from the heat. Refilling it is made easy. It only takes around 5 minutes to fully alight, using some solid firelighters. There is also no denying that it is very generous in size, huge in fact. Although it is all easy enough to assemble, the parts don’t seem to line up absolutely perfectly, and there are small gaps at the joints. It doesn’t take away from the effectiveness but could become annoying if that kind of thing bothers you. We also aren’t sure that the paint would withstand the outdoor elements and heat, but this could be easily fixed with a touch-up every so often. At least it looks handmade. It is a little bit pricey, especially as you can’t BBQ on it, but will really pack a punch in terms of design and looks. Despite the negatives, we wouldn’t think twice about having it in our gardens. For a true visual treat, this fire pit will be a brilliant focal point and give you plenty of warmth. 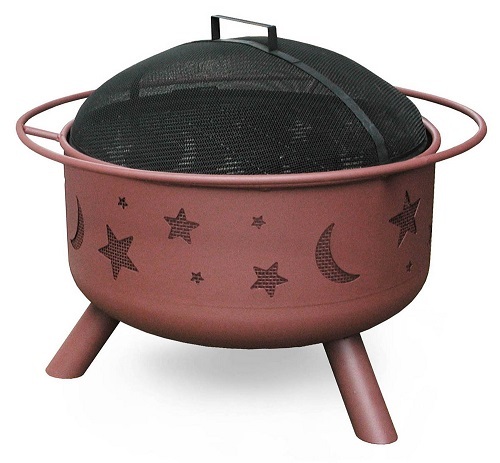 With an open mesh design and floral details, this little fire pit is a lovely addition to any garden or outdoor space. The mesh doesn’t only add a bit of atmosphere, but it also helps the heat get to you quicker. The steel build is substantial and feels sturdy, and the black powder coated finish is sleek and seems pretty chip and mark-free. You get a spark guard with the pit, which can be placed to prevent any stray sparks from leaving the appliance. There is no cover included, but as it is a pretty standard size and shape, we are sure there are plenty out there which can fit. Other reviewers have commented that it rusts easily if left out in the rain, so we would recommend not only using a cover but also moving it into a covered area or outbuilding when not in use. For the price, these little aftercare points are well worth it. Pretty basic and not the option which will last the longest, but if you take good care of it then we don't see why it can't see you through a few summers and help you get the most of the longer days but cooler evenings. 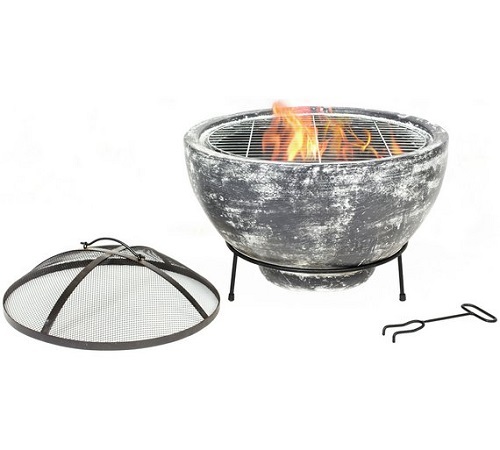 Style, elegance and an awful lot of heat are brought to your outdoor area with this fire pit. Handily, it can also be used as a cooking device. Even in the height of summer, the evenings can get a bit chilly. But that doesn’t mean you have to bring your party indoors. Just light this, and everyone can sit out until it goes dark (maybe even beyond depending on the neighbours). It is made from a durable steel construction so can withstand all that the elements may throw at it. The brushed bronze finish looks brilliant too so it can be a real focal point. The large chrome cooking grill offers plenty of space for a small family to have a light dinner, or if everyone wants to make some toasted marshmallows as an after dinner treat. It is surprisingly lightweight. If you have to pop it away in storage or move it to the side of the patio to cover in winter, you won’t have to struggle. It still is sturdy when in place, though. 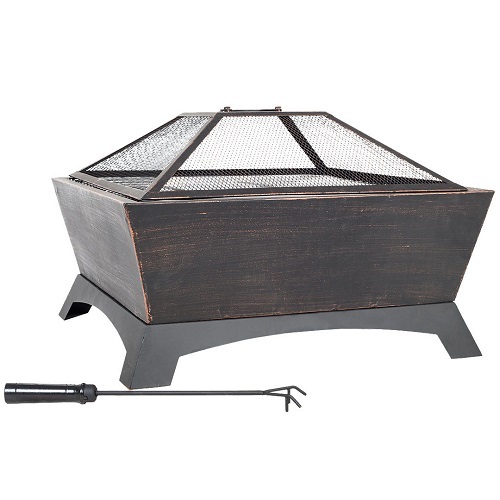 Should you frequently entertain and could do with a small garden table as well as a firepit to keep everyone warm, then this 2-in-1 garden heater will probably do the trick. In fact, it could even be described as a 4-in-1; feel free to use as a fire pit or table, but also as a barbecue or ice bucket. There is no denying you’ll be able to use it on any occasion. Just line it with some plastic if using as a drinks cooler. If you are using it as a fire, the included mesh lid will allow you to enclose the flames and stop embers escaping while still giving out heat and letting you watch the light. There is a poker tool included so you can move the logs or coal and remove the lid while keeping your hands safe. The steel frame is lined with brown and white mosaic tiles to add to the marble design, and the curved legs provide an authentic Italian feel. A waterproof cover is included to keep it protected from the elements and any rain/leaves when not in use. The bowl and legs are heatproof so should withstand even the highest temperatures. As seeing as it has so many uses, the price is very reasonable. The perfect little 4-in-1 back garden accessory for all of your parties, evenings in the garden and outdoor meals. For something truly robust and strong, this clay fire pit is perfect for small gatherings and adding to the atmosphere in your outdoor space. There is a solid steel base included for raising it off the ground, and you also get a mesh cover to protect the area from any sparks. You can use it as a grill, too, with the chrome-plated cooking grate in the package, so you are ready to get barbecuing as soon as it arrives. The colour, which is a slate/grey effect, is unique and makes it a lot brighter than the usual dark black models. Perfect if you want something a bit more modern with an authentic handmade look. Talking of handmade, each pit has been crafted by hand and painted by skilled artisans for a worn and rustic effect. Just fill it with sand before you light it to keep the clay protected from the heat – all details are in the instructions, so follow them well. We would also recommend buying a cover for it, so you can leave it outside, and it won’t fill with rainwater. One of the more difficult to look after, but the looks and ease of use are high and there is no denying it is fantastic quality. For the ability to have fireside cosiness and great food all at the same time, this Dancook outdoor fire pit receives top marks. Using either wood or charcoal, it is easy to bring this bonfire grill all to life. The steel and aluminium build will keep everything looking new and feeling sturdy for quite a while, even when facing the outdoor elements. The chrome plated grid for grilling is included and feels very well-made. The spacing is only slight, so there would be no problems holding smaller items just as well as larger cuts of meat and vegetables. We loved how the edges and surround don’t get too hot. Even though we obviously wouldn’t recommend touching anything without protective gloves or until it all cools down, it can prevent any nasty accidents if there are little ones about. If you want a cover, the Dancook 9000 cover is available as an extra. This is perfect and a must if you’re going to keep it outdoors and protected from the rain and wind. There are also a whole host of other optional items available, from a barbecue starter and utensils to a spark guard and a lid. It is unfortunate some of these aren’t included, but the possibility to buy them at least means you can personalise your fire pit to your exact needs. For anyone who wants an all-around glow but doesn’t want to settle for one of those boring open-mesh designs, this Landmann fire pit really adds to the atmosphere. The size is perfect for when there is quite a few of you to keep warm and fed, and it is also quite deep, so if you fill it up, it will keep burning for quite a while without you having to top it up. You can use both wood and charcoal depending on preference, and no matter which is used or how hot and smoky everything gets, the inner and outer colour doesn’t seem to tarnish in the slightest. It also feels very strong and well-built, so we predict it is an item which will last for years to come. Landmann is best known for their barbecue products, so it is no surprise that there is a full sized cooking grate included which can accommodate some food and snacks, although the spacing between the wires is quite generous so be careful nothing slips through into the fire. We would recommend putting a few inches of sand in the bottom of the pit to protect the steel base from getting affected by the heat of the large logs burning away and becoming marked. For a fire pit that is equally as good at grilling than heating, this Lanmann model will see you through all eventualities. The perfect size, weighing 3.2kg and including a storage bag, this fire pit was made with those who want to take it camping in mind, but also happens to be our best budget pick. The legs are foldable, so it can be transported almost flat, making it ideal for both carrying and popping in the car along with all the other necessities. If you love nothing more than making your own barbecue food when you’re away, then the added grill makes this pretty easy to do. It is chrome plated, so feels very strong and is easy to clean and maintain when the time comes – the last thing you want to be doing when you get home is scrubbing away. There is also a mesh lid to protect everybody and all your stuff from flyaway sparks. The mesh is really solid yet still lets out plenty of light and heat. You also get a poker tool to give you more control over the flames. Of course, it isn’t only for camping and portability. If you’re simply low on storage space at home, it is also perfect. Easy to assemble and fold down when needed, you can keep it indoors over winter if you don’t have a shed or garage and you won’t even realise it is there. A fire pit would be a great addition to your outdoor trip or staycation, and this one has everything you could need and want from one. The traditional wood versions are the most popular and widely available. They give off heat and a smoky smell for a truly authentic fire experience, like a campfire. Wood fires are slower to heat and get going than gas, and harder to light in inclement weather. Gas doesn’t produce smoke or much smell, so is perfect if you need a cleaner flame (such as living in close proximity to your neighbours or if you’re unsure how to control a fire appropriately). There may also be some campsites or areas which don’t allow wood fires due to the risk to woodland or property – gas would be a failsafe option in these cases, just in case. Gas does usually produce less heat though, so if this is the primary consideration, it might not be the best. Fire pits can range anywhere from around £30 to over £200. The more expensive ones aren’t always the best, nor are they also the ones which give you everything you will need to start your fire pit journey. Think about other factors such as the size you need, what is included and the design. The beauty of having a fire pit which can be converted into a grill/barbecue is that it is a 2-in-1 product, so only takes up one area of space but is multifunctional. It probably is not as good as having a separate, dedicated barbecue, but will still cook your burgers, sausages, veg and kebabs perfectly given you can control it well. How Do You Light A Fire Pit? If you are using a traditional burner, you will need some wood or charcoal (whichever you prefer or the appliance can use), as well as some firelighters or a match/light. Make sure everything is dry, or it won’t light, and that there is enough material in the pit to get a good fire going. Once it is, then you can add more material later to maintain the fire or make it warmer. If you are on gas, this should be as easy as using an automated lighter and a dial or switch to change the level of heat. Are Fire Pits Easy To Clean? You will need to remove any ash which builds up, as well as general cleaning to keep it looking great and working at its best. Some have dedicated ash collection trays, but the majority will need to be tipped upside down and emptied or brushed/scooped out. Always dispose of ash by dousing them in water once removed to make sure they can’t still catch, and keep them in a metal can. As for wiping it down, if it is steel, then water should be enough if it is done after every use, but you may need a bit of soap in it too to remove any stubborn burns. If cast iron, you may need wire wool. With gas fire pits, you will need to ensure the burners are kept clean to keep the gas flowing and check it regularly. Do Fire Pits Rust Easily? A metal fire pit could rust for a number of reasons, mostly from the outdoor elements and weather though. Using it frequently will decrease the likelihood of it rusting, but you can also take measures such as keeping it protected from wind and rain by using a cover, or storing it in a garage or shed over winter. You may be able to spray it with protective paint if it is steel, to either cover the marks or prevent them from occurring. Can I Use My Fire Pit On Grass Or Decking? Because they give off a lot of heat and some ash, it is not recommended you use a fire pit on a flammable surface. It could also leave scorch marks on grass or other similar surfaces. There are heatproof bases and surfaces available, but the best option is to set it on some paving and make sure the area is cleared of any other materials.